Bryce Tomo Wedig and Hannah Marie Wedig, said, “We’d like to send some relief money to the earthquake victims who have sought refuge in Okinawa.” Richmond, Indiana, United States. To raise money for the victims of the Great East Japan Earthquake, 15 year-old Bryce Tomo Wedig and his sister 14 year-old Hannah Marie Wedig, who live in Indiana, ran a stall at their Haru-matsuri (spring festival), held in Earlham College in Richmond, raising $1304. Soon after the earthquake, Bryce and Hannah said that they would like to do something for the earthquake victims. They ran a stall in the Haru-matsuri (spring festival), which introduces Japanese culture, selling Japanese accessories and handmade sweets donated by The International Ladies Club and by Japanese people residing in Richmond. 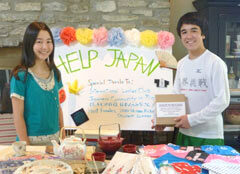 Bryce and Hannah told customers that they would donate all the proceeds to the earthquake victims in Japan. Many people also donated cash. After raising money for the victims at a garage sale in June, they are scheduled to visit Okinawa in the middle of that month.